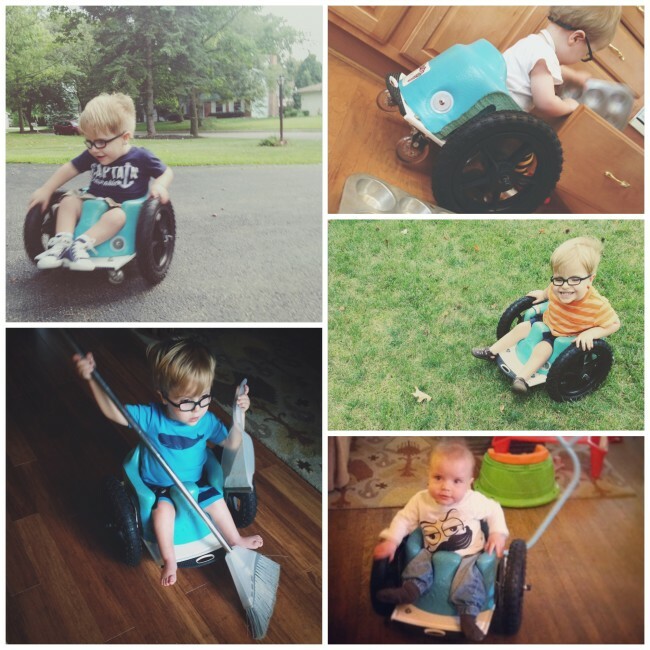 Here’s the thing about my son’s mobility device: sometimes, it feels a bit… alive. I mean, I know in my brain that Simeon’s wheelchair isn’t actually alive, but way down deep in my heart, where I keep all the feeeeeeeelings, I totally believe it is. Maybe it’s because my son never attached to a binkie or a lovie or any other cute little baby item. He never snuggled a blanket into sloppy oblivion from years of gummy affection and drool. He didn’t drag a teddy around the house or cuddle up with a stuffed rabbit (who became “real” after surviving a scarlet fever outbreak and being thrown away in the trash — but that’s a story for another time). Point is, nothing was by his side through thick and thin, during those first few years of life. Unless you count the wheels. I remember when they arrived in the mail, passed along to us by a family in Minnesota whose daughter had outgrown them. We sat him in the snug foam seat and placed his squishy little palms on the wheels, moving them back and forth as he watched us uncertainly. He sat in it all evening– even ate his dinner in it. He wasn’t going anywhere – not yet. And then, a few hours later, he moved. He wheeled up to the large wooden door of our dining room chest, the place where we kept our wine glasses and cork screws and fancy dishes. He pulled it open, maneuvering his wheels this way and that, figuring out how to bring his little face in close to the musty dark interior while making room for the wide swing of the cabinet door. He looked inside. He snatched up a little shot glass, turning it over in his hands, all while I sat on the floor taking pictures and beaming like my heart would burst. It was the first time my 11-month-old was able to act on his curiosity – the first time he had the means to act on his wonder. It was the start of a grand new chapter in my son’s life. But that was years ago. And babies get bigger and blankets fray. Teddy bears lose their stuffing, and wheels that once fit start feeling a bit too snug. Simeon had a good run with those wheels, but a few months ago, we knew we were at the end of the road. His legs are so long now that his feet almost touched the floor. The seat was too tight, and he preferred his big boy wheelchair. My husband and I went back and forth. Maybe we should keep it a few months more? His feet don’t quite touch the floor, they just almost touch the floor. Maybe his sister can use it? But we knew it was time. So I messaged a fellow spina bifida mom, made the arrangements and headed to the FedEx store. The man behind the counter set Simeon’s chair on his scale. He told me how much it would cost to ship and pack. He took my credit card and passed me a receipt to sign. “Thanks, you’re all set,” he said, giving me a little wave of dismissal. I ran my hand along the foamy seat and felt the bumpy wheels under my palm. Alive like something full of memories and joy and trouble. Alive like exploration and adventures. Alive like banging into walls and wheeling into ankles and chasing your dad down the driveway. 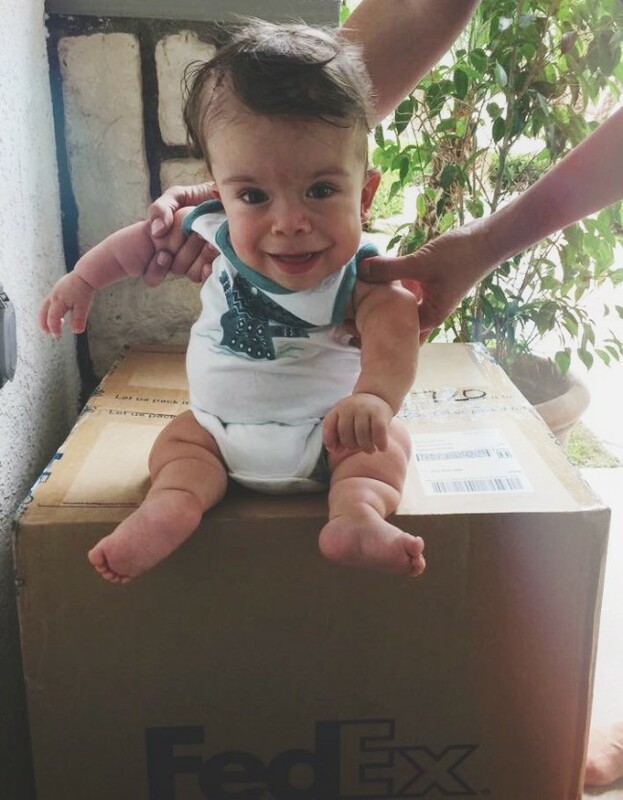 Alive like crying in front of the FedEx guy, telling him to please take care of this thing that helped my son open a big wooden cabinet and grab a shot glass – this thing that took his curiosity and turned it into action. I know in my brain that Simeon’s wheelchair isn’t actually alive, but way down deep in my heart, where my memories live and the FedEx guy can’t see, I totally believe it is. And one of the great things about being alive (and things that become real, like wheelchairs and Velveteen Rabbits) is that each chapter leads to another. So we’ll turn the page and say farewell, old pal. Best of luck on your next adventure. 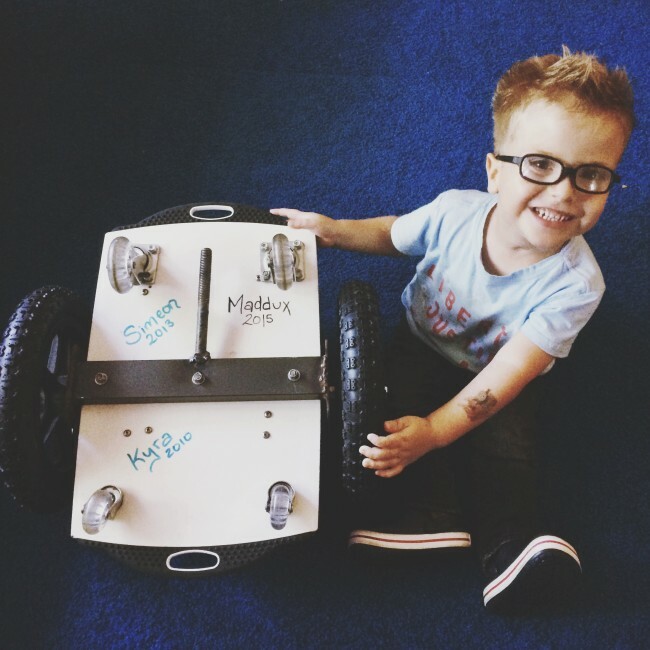 The Velveteen Wheelchair now resides in California with our pal Maddux. 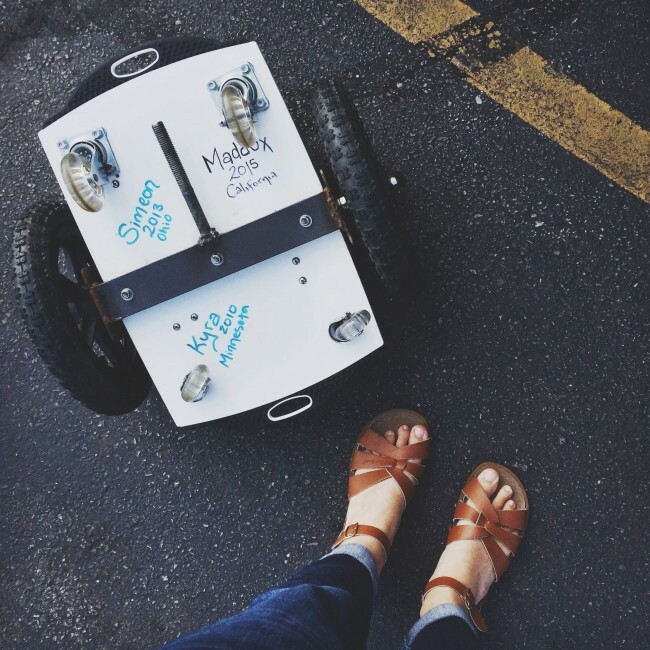 You can follow Maddux’s adventures on his blog and Facebook page. 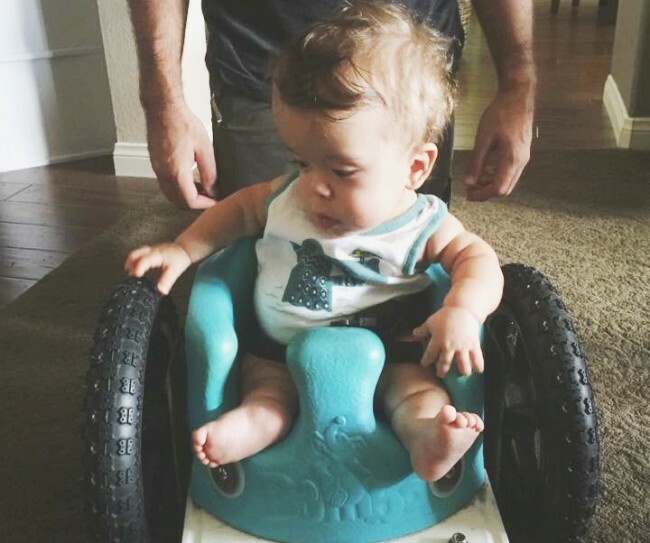 You can learn about making your own Bumbo Wheelchair here. This post originally appeared on What Do You Do, Dear?